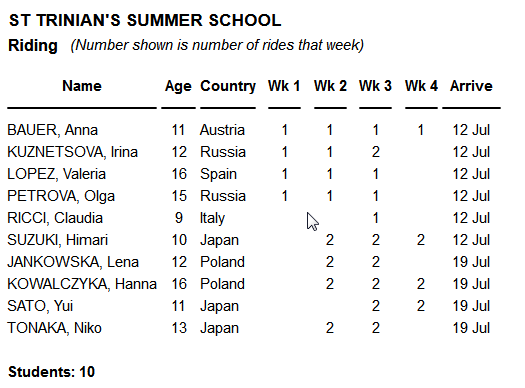 A leading independent girls’ boarding school needed to have a database to control registrations and administration for their summer school, where overseas students attend on a residential basis for English lessons and a wide program of activities. The Sesame database records registrations, medical and personal information, language proficiency and all contact information for parents/guardians. Invoices are generated by linking to Microsoft Word. Travel information is recorded and reports printed for the weekly arrival dates so the girls can be met at their arrival airports. During the busy 4 weeks of summer school a team of staff have network access to the database and record enrolment in activities, progress in classes, and any exeats. 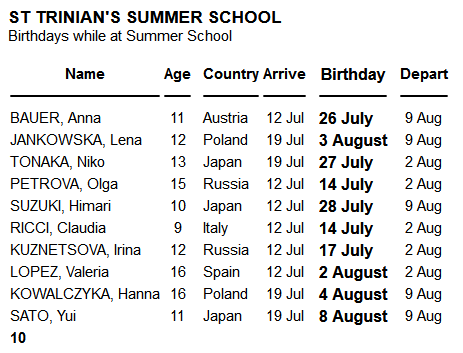 A photo of each student is included in their record. An important requirement of this database application is that staff recruited for the summer school – who have no experience of the Sesame database system – can use all the facilities they need to with little or no training. This includes running dozens of different reports, some of which are run daily or even several times a day, to meet continually changing circumstances, so intuitive report menus are provided. Reports include the Fire List, and a bedroom allocation report arranged geographically, so that the housemothers can make a tour of the premises checking that the students are where they should be. All health and safety considerations can be met, and security is effective. More recently, the application was expanded to accept bookings directly into Sesame from the school’s website, the web programming provided by an associate. 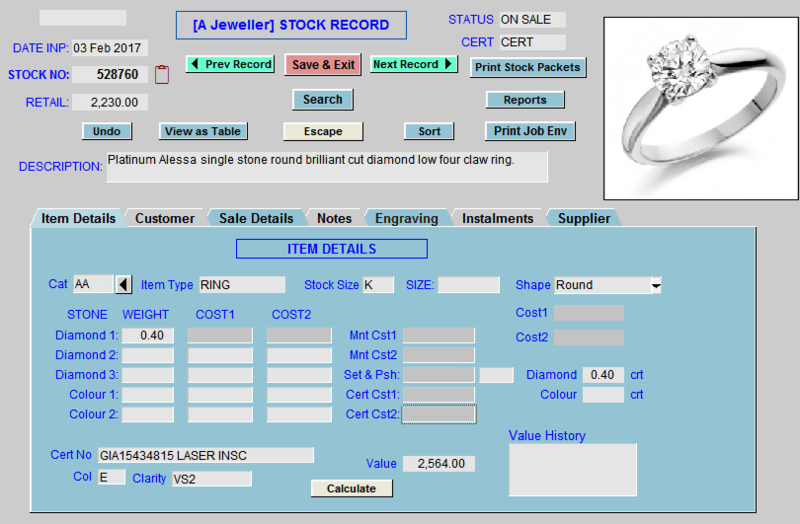 A central London jeweller wanted a complete point-of-sale application linking stock inventory, recording sales and payments (recording deposits taken and multiple later payments), and stock re-ordering. Later workshop job logging was added, with work done married to the history of the stock items. A requirement needed a step-by-step ‘wizard’ to take the salesperson through the stages of selling a diamond ring, at all stages ensuring complete accuracy and allowing flexibility and review of each stage, right through to payment. The salesperson has a simple login at the start of the sales process, and is automatically logged out at its conclusion. At the end of the sales process up to 4 documents are printed, which can include an invoice, a valuation, a job envelope for workshop (ring sizing, engraving) and a work docket to go in the job envelope. There’s an option to email the invoice as a PDF if an email address is given. Printing of price tickets onto special ring labels (able to withstand ultra-sonic cleaning) can be printed directly from the database. Comprehensive security allows the different users to access only those parts of the system for which they are authorised. Refinements over the years have included adding a staff incentive scheme, and emailing the invoice as a PDF as part of the sales process. This networked Sesame application has been in daily use now for over 10 years. 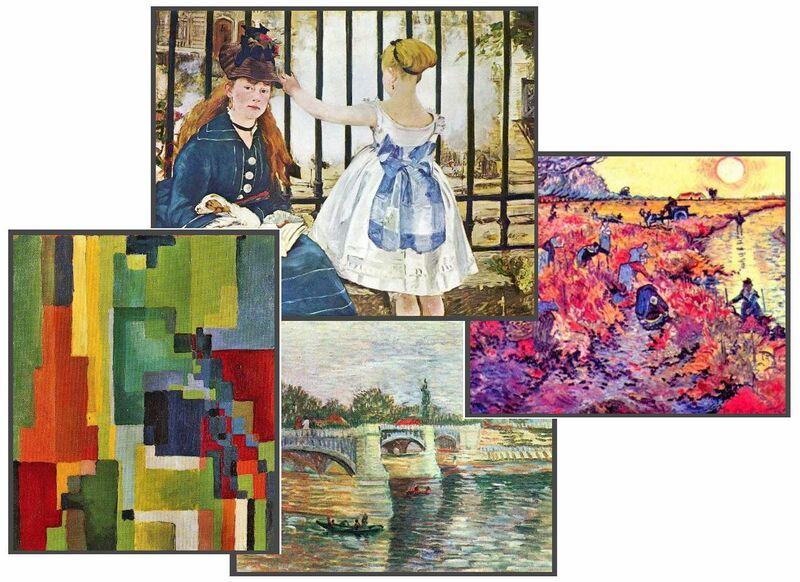 A leading West End art gallery – a client of many years standing – utilises a Keyword Software built Sesame database for many aspects of their business. This includes customer relations management, inventory control, stock location history across multiple sites, sales processing and shipment. As you would expect, each artwork is shown in a picture field. 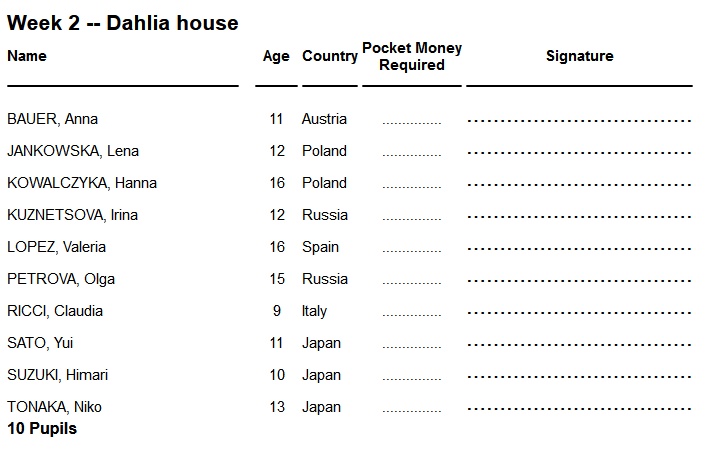 Exporting to countries all round the world, multiple currencies and bank accounts are supported. Invoices and Shipping invoices are generated within Sesame and can be printed or emailed as PDF. Reporting facilities are extensive and detailed financial analysis can be performed. Sesame’s extensive export facilities are used to link to other functions. A private medical clinic needed a database for recording detailed test results and managing appointments for multiple doctors. The Sesame database delivers all this, including an easy to use appointment calendar showing all the appointments for each doctor for a particular day. 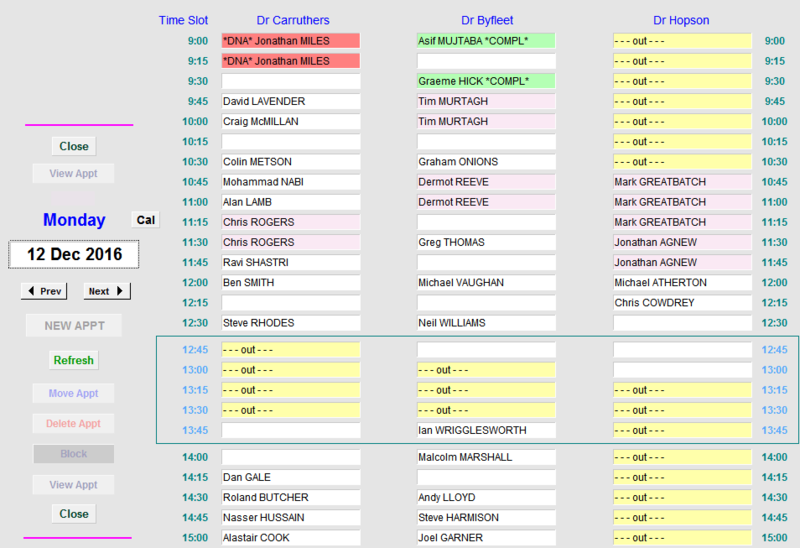 Colour coding shows the type of appointment, including missed appointments. It is easy to block off times for a doctor, either for an hour or two or even days or weeks at a time to accommodate holidays. As expected, access is controlled by Sesame’s security. An international distributor of medical supplies uses a Keyword-designed Sesame database for compiling orders and issuing invoices in several currencies. The need for a limitless number of line items is met by Sesame’s subform facilities and printing of the invoices is handled by Sesame’s sophisticated “PrintString” programmed method which has proved 100% dependable over many years. A simple Sesame database was wanted by a social club for managing its membership. A simple one-form database suffices, which allows the secretary to monitor annual fee payments and print out badges for social functions. Reports tell them all they need to know. An international chemical sales company, based in Europe, needed a database for processing orders. Buy and sell prices are recorded, shipments recorded, and invoices and delivery notes generated directly from Sesame. Multiple currencies are supported and the appropriate bank account information shown on the invoice. All reporting requirements are met by Sesame’s powerful HTML reports. A commercial property company uses a Keyword-designed Sesame database to manage their portfolio, recording ground rent invoices and payments. A specialised recruitment company needed a database to match candidates with employers’ requirements. Sesame’s sophisticated keyword field search facilities provided the solution. Note: all data shown on this website is fictitious. No actual client data is shown.